I presented this paper at the joint meeting of the Society for Ethnomusicology and the Congress for Research on Dance in Philadelphia, PA (November 17-20, 2011). The Dance Central section represents my current research project (still in its early stages); the cybershala section is condensed from a longer treatment in my new book, Playing Along. Interactive digital media technologies are gradually transforming the face-to-face, body-to-body transmission contexts that have always played a crucial role in music and dance pedagogy. YouTube, blogging platforms, and other online social media forums have given rise to countless virtual communities of practice. Meanwhile, digital game developers are seeking to bridge the gap between virtual and visceral experience by creating new kinds of controllers, motion-sensing devices, and gestural interfaces (e.g., those employed by the Nintendo Wii and Xbox Kinect). Despite the limitations of current technologies, millions of people are turning to online media and digital games in the pursuit of new corporeal skills, experiences, and knowledge. Today I’m going to present two case studies in techno-mediated transmission. First I’ll address the “cybershala” created by yoga bloggers, a web-based community of practice that sometimes comes into conflict with traditional authority. Then I’ll turn to Dance Central, a videogame that teaches players full-body choreography routines set to popular club music, offering real-time feedback using a motion-sensing camera peripheral. While time limitations will prevent me from doing justice to either case study, I think it’s worth our while to consider how they inform each other. These examples illustrate some new possibilities for the transmission of embodied practice, for converting virtual social connections into visceral common knowledge, and for imagining what it’s like to live in someone else’s body. 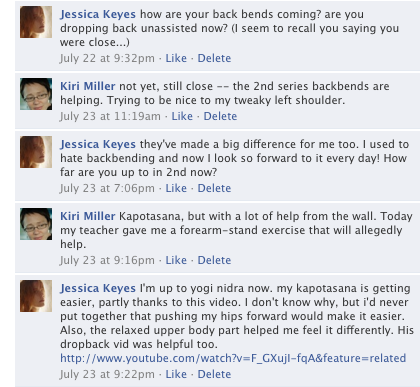 One day in the summer of 2010 a friend posted a comment on one of my Facebook status updates, asking how my backbends were coming along. At the time of our Facebook exchange my friend and I were both partway through learning the second series, 3,000 miles apart and working with different teachers. The ashtanga curriculum offers a structuring framework for online discourse and visceral common knowledge. (Cf. Hamera 2007 on how dance builds "relational infrastructure".) Everyone who practices second series knows exactly what it means when I say that I am working on kapotasana; they have their own sensational knowledge of that asana. If the asana came more easily to them than to me, then they also have a visceral understanding of the differences between our bodies. I’m not really sure what the Cybershala is but I’ve heard it referred to more and more lately. It seems to be an online community not located at any one site or of a fixed membership. It seems to be made up of blogs, comment threads and forums, corners ofFacebook, YouTube, chatrooms, and Skype connections. Anywhere where one’s practice can be posted, discussed, commented on . . .
An overwhelming number of yoga blogs, videos, Facebook updates, Twitter feeds, and other forms of online social media now constitute a “cybershala” of ashtanga yoga practitioners—many who work with teachers regularly, others who are cultivating a practice as “home ashtangis” (cf. Finnegan 1989 on “hidden musicians”). Yoga bloggers face a challenge familiar to ethnomusicologists and dance scholars: how can one communicate kinesthetic, multisensory experiences without bodily presence and a shared sensorium? Home ashtangis have adopted exactly the same tactics that the anthropologist Jaida Kim Samudra advocates for scholars writing about kinesthetic cultures: first, attempting to “linguistically record the minute details of one’s bodily training” even when this is explicitly discouraged in traditional transmission (2008:670); second, being attentive to one’s own internal bodily sensations in order to better comprehend other practitioners’ experiences (674); and finally, creating “somatic narratives,” which comprise both “the series of actions narrated by bodies during limited frames such as practice sessions, performances, or competitions” and “the stories people tell about what happened to and with their bodies during specific events” (674). Yoga bloggers often combine video, still images, and lengthy written accounts to communicate these somatic narratives online. As I watched the videos my friend recommended, my body shifted in my desk chair as though operated by remote control: back straightening, shoulder blades sliding together, legs subtly rotating in hip sockets, toes spreading to grip the floor for a vicarious backbend. I heard myself breathing. I experienced the blogs and videos through my accumulated “sensational knowledge” (Hahn 2007), just as I had learned to reenact my teacher’s physical adjustments while alone on my mat—the virtual hand drawing my hip back, the virtual foot nudging the angle of my own foot on the floor, the virtual arm stopping me from taking my legs past vertical in a headstand. It was very much like the experience of listening to music that I knew how to play. Watching these videos also gave me the uncomfortable feeling that I might be cheating on my teacher. Ashtanga students are not supposed to start experimenting with advanced asana of their own accord. On the other hand, the structured nature of ashtanga makes it particularly well suited to independent practice, amateur-to-amateur pedagogy, and online discourse among a dispersed community of practitioners. 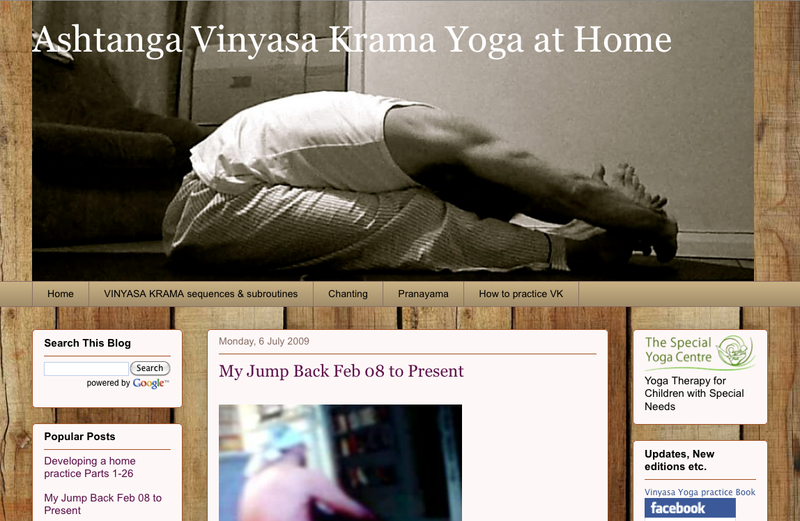 Browsing YouTube videos of ashtanga backbends quickly led me to “grimmly2007,” who had uploaded about 300 videos so that he could embed them in his yoga blog. Grimmly is an ashtanga student without a teacher—an impossible contradiction to many practitioners, but one that is getting more possible all the time. He lives in the United Kingdom and works as a repairer of woodwind instruments. In early 2007, Grimmly’s flat was burgled and seven saxophones were stolen. This incident made him so angry, and then so irritated with his own anger, that he decided to take up some form of meditation. In the course of reading about meditation practices, he learned that “a lot of meditators were also doing yoga,” so he looked for a yoga book at the library and found Tara Fraser’s Total Astanga (Fraser 2006). As an overweight 43-year-old man, he was a bit embarrassed even bringing the book up to the circulation desk. On his blog, he wrote, “Going to a yoga class wasn’t something I even considered. A guy here, outside London, might think about going to a gym to get in shape but not a Yoga class, probably not even an aerobic class” (Grimmly 2010: part 1). 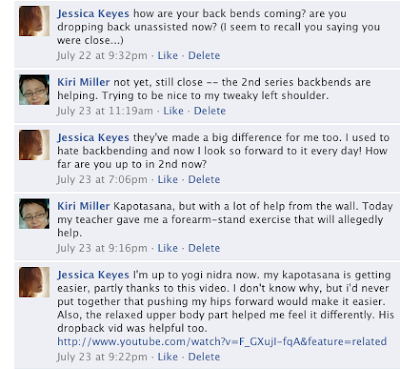 The blog was originally intended to document his progress on the “jump-back,” a transition between many asana. Grimmly eventually produced 57 posts on the jump-back, many including slow-motion videos of himself and other practitioners. As Grimmly developed his home practice, some of his choices posed challenges to ashtanga orthodoxy. 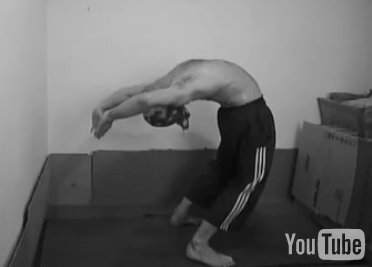 For instance, when Grimmly blogged about his decision to begin learning the second series of asana, one commenter told him that he should not be learning any intermediate asana before he could stand up from a backbend: “Then and only then you start to add intermediate to your existing primary. Your teacher would give you each new asana as he saw your progress. . . . Traditionally in India, yoga has been learned from teacher to student, not from a book or video. It’s really not right to decide to give yourself postures” (Sophia, comments posted on Grimmly 2008a). When making such claims about traditional practice, ashtanga practitioners often invoke the ultimate authority: “how it’s done in Mysore,” at the Ashtanga Yoga Institute. But in this case another commenter offered evidence that the teaching method in Mysore had changed over time. Ursula, a woman from Germany, reported that at the Mysore shala she had been given the first pose of the intermediate series before she could stand up from a backbend. When another commenter suggested that this experience might have been “an aberration,” Ursula responded by invoking the higher authority of her own bodily experience: “Sorry to write this, but what I see is that people hanker for rules, because there is so much insecurity. . . . Why should I not do these softer back bendings which are good for the back? Only because there are rules, nobody really knows who invented them. . . . I listen to my body.” This discussion continued at length, showing how the print medium and time-delayed norms of comment threads have encouraged the development of cybershala discourse. Discussants can take time to craft their replies and cite their sources, which in this case revealed the fluidity of “official” ashtanga pedagogy in Mysore. After a year and a half of home practice, Grimmly finally decided to try attending an ashtanga class at a shala. He went two Sundays in a row and was “blown away” by the physical adjustments he received from the teachers there. But a week later, he explained that he doubted he’d go back: “All the time it’s just been me on my mat, alone in a room early each morning, my practice…Somehow now, after visiting the Shala, it feels a little like I’m practicing for someone else…I feel more distant from my practice, less involved” (Grimmly 2008b). It’s clear from other posts that Grimmly developed his practice using books, famous teachers’ DVDs, YouTube videos, other students’ blogs, and any other media resources he could find. He often writes about insights gleaned from these sources. Nevertheless, the “live” teaching at the shala somehow alienated him from his practice. While he benefited from the physical adjustments he received, he was willing to forego them in order to maintain a sense of agency and responsibility for his own development: practicing for himself instead of a teacher. Both the cybershala and Dance Central make it possible for practitioners to learn a physically demanding, minutely codified repertoire without ever interacting with a physically-present teacher. 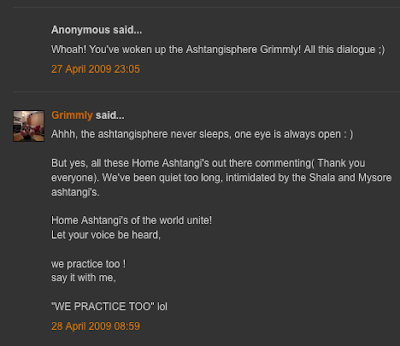 Grimmly and his fellow cybershala practitioners are creating new transmission modalities for ashtanga yoga, from reflective writing to side-by-side slideshows that might reveal hidden traces of corporeal knowledge. Meanwhile, Dance Central players are learning hours of choreography while also working through their ideas about gender identity, public and private performance, and virtual community. These paradigm shifts in yoga and dance transmission might shed light on similar changes in the transmission of performing arts traditions that rely on a lineage of teachers and students, body-to-body pedagogy, and a codified repertoire or fundamental skill set. 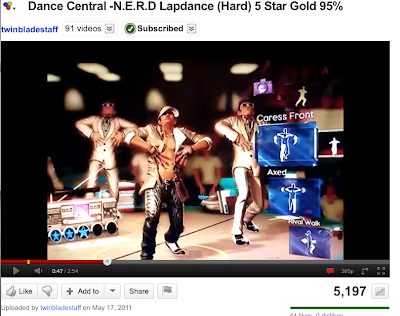 Dance Central and the cybershala show how professional game designers, home ashtangis, and living-room dancers are all finding ways to use available technology and social media platforms to support the virtual transmission of embodied practice. 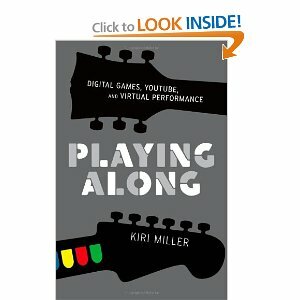 I just noticed that Kiri mentions her book , Playing Along has been published too on Amazon. It has the LOOK INSIDE feature and if you type Cybershala you can read a fuller treatment of the Cybershala phenomenon. Page 5 …possibilities of his own body by participating in the “cybershala. Page 209 …and other forms of online social media now constitute a “cybershala” .. Page 210 …that I was part of an Ashtanga community , the Cybershala. [ .. Page 212 …at odds with the reams of verbiage in the ashtanga cybershala). .
Just saw the link in facebook and read the article, amazing indeed. It is a true new phenomenon how we learn collectively, that only appeared what? 6 years ago? it is so new it is great to be a part of it, and you are a true lidder G! Thank you AM, nice profile pic. Have added you blog to my list too, hope that's ok.
Is this a bad time to call ? "No merit to speak of." Primary and 2nd in two hours?